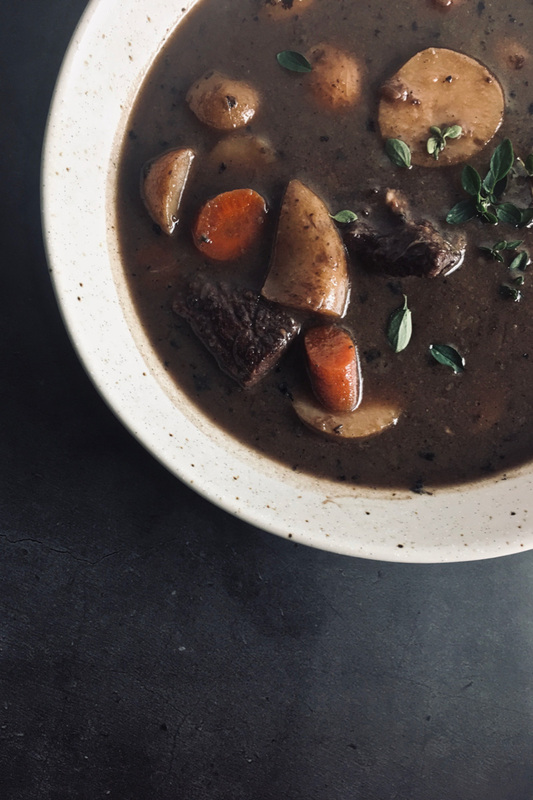 Years ago I made a Beef and Carrot Stew that has been my sorta go-to recipe to build off of and it’s evolved a bit over the years (wow almost 6 years now!). 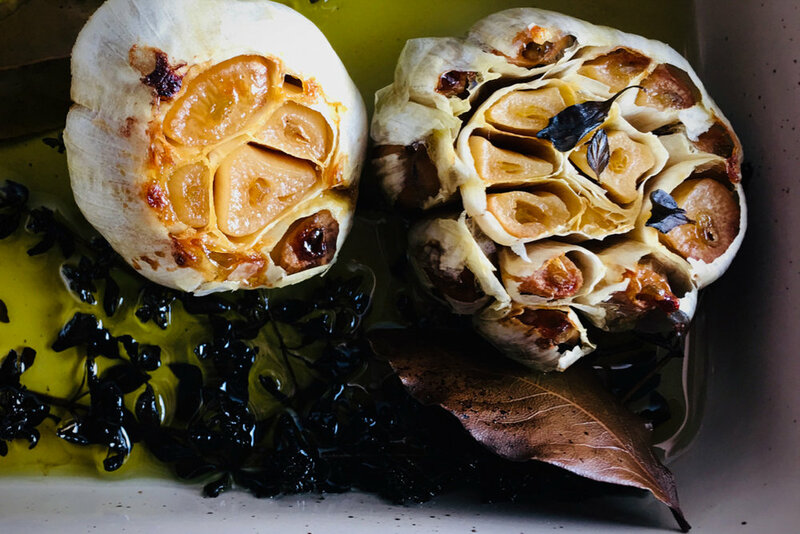 This new recipe, with the addition of Roasted Garlic and Roasted Garlic Olive Oil, is over the top good. I also use red wine rather than white wine, and add beef broth. I hate to boast about stuff like this because you might think meh, why is she going on about this. I think the addition of the roasted garlic really did it. You get the rich flavor of the garlic without it being too strong. All the photos on this post were taken with my iPhone, which is a first on the blog here, I’ve been posting more on Instagram these days which are mainly top view photos, my phone is fine for that but for me, anything else (more cinematic) deserves a good lens. My iPhone is oldish (6s Plus) so maybe when I update it I might have a different feel about it, but hard to see how it could out-do a macro lens. Anyway, I recommend this Beef Stew! It’s just so so good! Enjoy friends. Place beef in bowl and a bit of flour to coat, add a bit of salt and pepper and toss. In a dutch oven or large soup pot, add a bit of olive oil over medium heat. Add the beef, working in batches as to not overcrowd the pan, and brown on all sides. Set the browned beef aside in a bowl. Add the onions to the pot and add a bit more olive oil if needed, cook until translucent. Add the wine and cook for about 5 minutes or so over a medium low heat. Add the beef broth and bring to a simmer. Add the beef, carrots, potatoes, roasted garlic and herbs. Cover and simmer on low for 1 1/2-2 hours. Taste the broth about half way through to see if it needs a bit of salt and pepper seasoning. When ready the beef will be tender. Serve with sour dough bread slices topped with roasted garlic and soft butter mix. You can make as little as 2 heads or as many as you’d like, it will keep well in the refrigerator and you can use the oil for other dishes. Preheat oven to 350°. Place the garlic in (deepish) baking dish or cast-iron skillet, drizzle olive oil over the garlic and fill the dish with olive oil almost to the top or half way up the garlic. Arrange the herbs around the garlic. Seal tightly with aluminum foil, then roast for 45-50 minutes. Remove foil, turn oven up to 400° and return dish to oven, roast for an additional 10-15 minutes until browned on top. Remove from oven and allow to cool a bit. Place the garlic heads in a bowl. Separate the cloves and squeeze the pulp into a jar. Discard the skin and herbs. Strain the oil into another jar, store in a cool dark place, but it will last longer in the refrigerator.